I had a great time this past weekend at the EVO Conference. These bright and cheerful patriotic cookies are going to be great for your 4th of July festivities. By the dawns early light? No need to get up that early. You can put these beauties together pretty darn quickly. Oh the beauty of a cake mix. This past week has been full of events that have given me the opportunity to reflect a bit on the blessing it is to be American. At my daughter Annas school the 5th grade teachers helped the students put on a great little patriotic program. I loved hearing the cute kids sing about America, and the wonderful gift that freedom is. my friends, is what I had on the mind while I sat in a camping chair holding LittleTwinBoyNate, watching some spectacular fireworks. some of our closest friends. I live a blessed life. Blessed with a beautiful family. Blessed with dear friends who make my life so full. land of the free, and the home of the brave. 1. Here are your ingredients in all their glory! To make the red dough combine one of the cake mixes with 1/2 C melted butter, 1 egg, 1 T water, raspberry jello and the red food coloring. Mix until everything is well combined and you have the color you like. You can add a bit more food coloring gel if needed. 2. 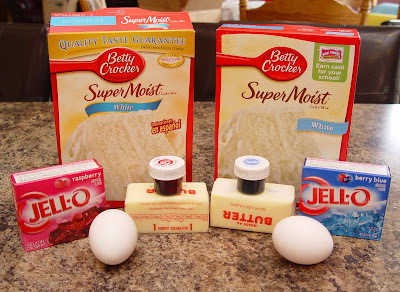 Make the blue dough by following the directions in step 1…just add the blueberry jello and blue food coloring this time. 3. 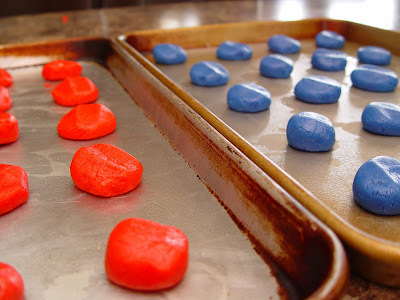 Roll them into 1 1/2 inch balls and place them on a sprayed cookie sheet. Bake for about 8 minutes at 350 degrees (6 minutes at 330 for convection ovens) Watch them closely. I like to take mine out when the cookies have cracks running along the outside, then let them finish cooking on the hot sheet for about 3 minutes. 2. Frost the underside of each blue cookie, then add a red cookie to it! 1. Melt your chocolate in a small bowl in the microwave. Only heat it for 30 seconds at a time, stirring after each cooking interval. Don’t let the chocolate get too hot! 2. Add the shortening and stir it around a bit until it melts into the chocolate. 3. Place the melted chocolate into a ziploc bag. Carefully cut a little hole in the tip of the bag. Decorate as desired and sprinkle with the red sprinkles. If you are using the sprinkles be sure to use them before the chocolate sets up on the cookies. Enjoy! Happy Fourth of July everyone! Cute cookies. Glad we were able to meet in person! These are absolutely adorable. Love them! Where did you find the blueberry jello? I haven't been able to find it yet. I wasn't able to find it at Smiths but they did have it at Walmart. I'm so glad that I was shown your blog because you have some awesome recipes! I was telling my husband that I can't wait until our next shopping trip so that I can make some of these. 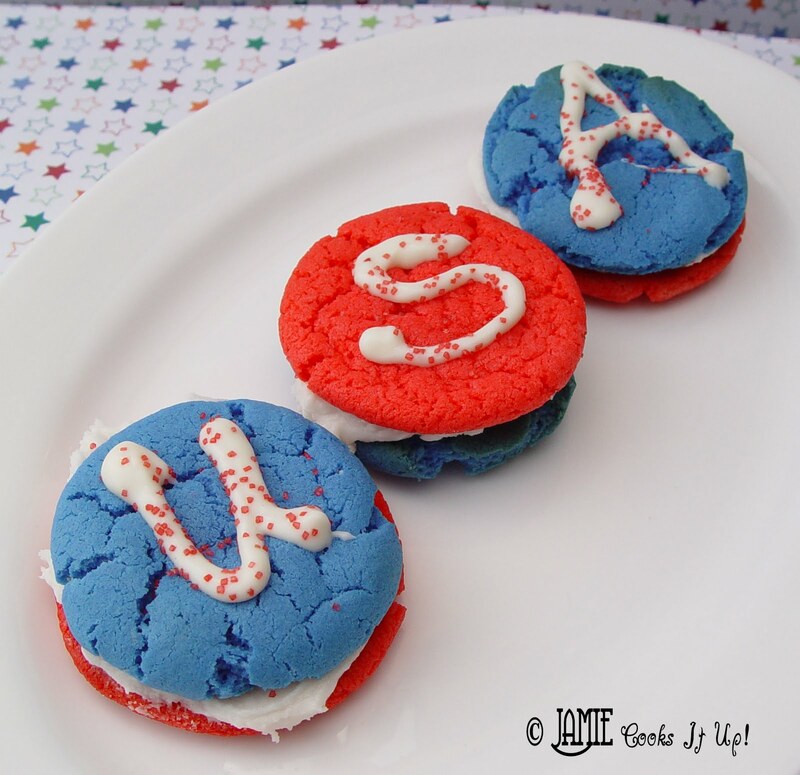 In the meantime, we are making these cookies and my girls are in heaven. Thank you for your cute and yummy ideas! 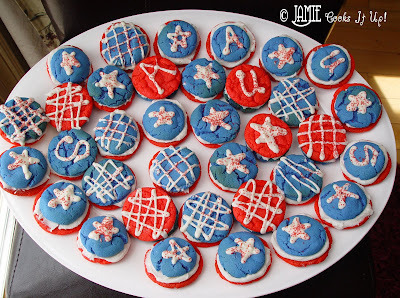 These look fabulous and I can't wait to make them for the 4th. I shared your recipe on my Must Try Tuesday blog post this week. Thanks for your sweet comment today, Judy. And thank you to your family for their sacrifice. 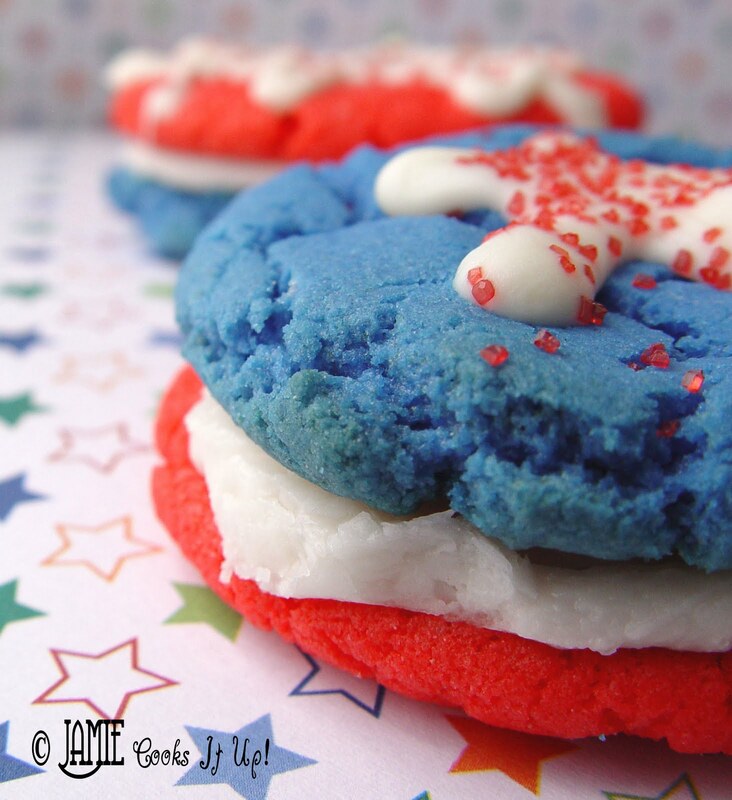 The jello is a major component for these cookies. It adds the color and the flavor. Best to leave it in.